"Tailoring forms the backbone to this collection." The brand pointed out as it presented the SS19 collection. 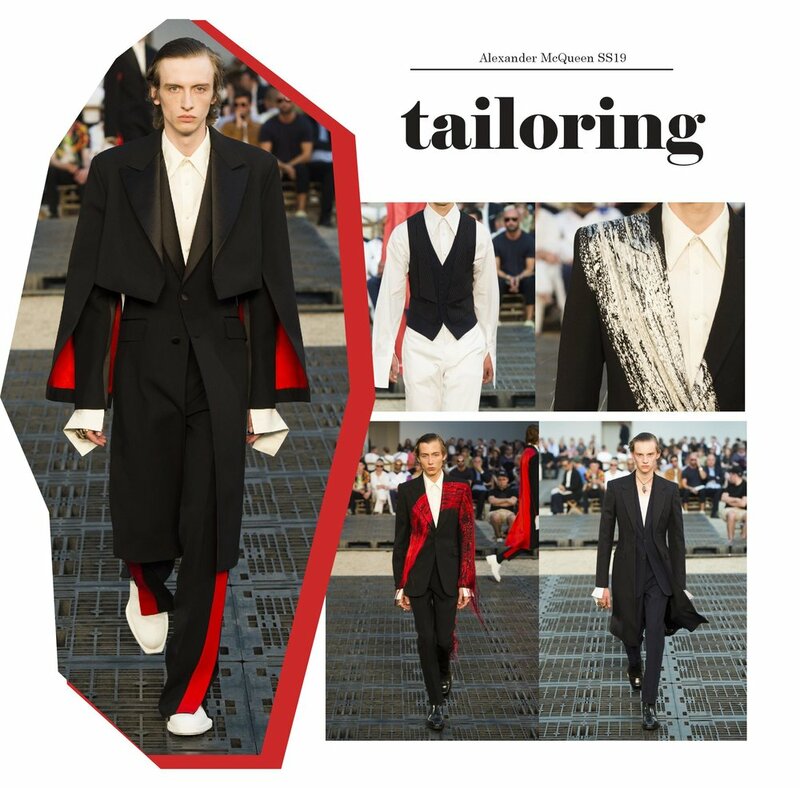 Sharp-shouldered suiting and precisely cut double-breasted coat, you can see the tailoring skills which McQueen was known for relived though out the show. Sarah Burton again shows the fashion industry how the genuine luxury brand should do its collection like she did in the Aw18 Ready-to-Wear. From the classic suits to red and white tassels embroidered onto the blazer, she makes the tailoring heart of the collection. Patterns on the leather jackets reflect the inspirations for this collection. Sarah Burton captures the mid-twentieth British painter Francis Bacon's raw and old images, mixing them with the rock spirit of McQueen. Body painted model in biker trouser with the blue leather jacket tied on the waist so powerful lightens up the show. Graffiti works by the Soho photographer and painter John Deakin are embroidered on the biker jacket and trousers. Hair effortlessly slicked back, you can easily imagine the untamed stylish man walking in New York streets in with the wild Deakin soul. The mismatching items highlighted the entire collection. It is extremely challenging to work when it comes to mismatching. You don't want the outfit looks like a drunk dude who fell into the garbage truck. Make a highlight of the outfit and keep it simple at the same time. Ripped knitted sweatshirt paired with red stripes leather pants perfectly define the mismatching essence. Putting soft and stiff material together, Sarah creates a very streetwear look yet captures the luxurious color combo. I was so impressed when the model in the half-blazer-half-trench coat walked down the catwalk. The design is very clean regardless of how complicated the concept is.